It’s been said that the way to make money during a gold rush is to sell shovels. However, a few clever men decided instead to earn their riches building a mint. In the late 1850s a few lonely gold prospectors discovered 20 troy ounces of gold in the small town of Little Dry Creek. Today the area is a Denver suburb, but back then it was part of the sprawling frontier promising wealth. Stories of Rocky Mountain gold spread. The outpost grew. Miners from across the country descended on Little Dry Creek and other neighboring areas. The industry developed and infrastructure followed. Newcomers needed food and lodging. Those lucky enough to find gold needed a way to convert it to coins. Emanuel Henry Gruber saw an opportunity. Along with his business partners Austin and Milton Clark, he established a brokerage firm office in Denver. 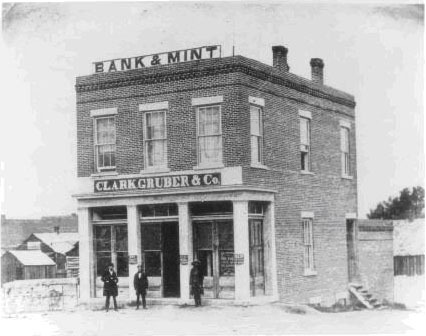 In July of 1860 the men opened a private mint. The operation was nothing more than a two-story brick building. They began by minting $10 gold pieces. Eventually, they added a $20 gold piece. Each featured a relief image of Pike’s Peak with an image of an American Eagle on the reverse. In just three years Gruber and his partners minted more than half a million dollars’ worth of gold coins. The business also shipped gold. Gruber and his partners sent parcels containing gold dust to the Philadelphia mint for processing. Gruber, it seems, was too adept at spotting opportunity. After these first three years the US government saw the potential of Colorado’s mines and set up an assay office with the purpose of formally testing the purity of the gold in the area. To do so, they bought Gruber’s mint for $25,000. Coin production stopped. The office decided instead to simply stamp gold bars indicating weight and purity. By the early 1900s Denver started construction on their own mint. In the first year of operation the mint produced more than 167,000,000 gold and silver coins with a total estimated value of approximately $27 million. Today the coins are a vestige of another time. The smooth finish represents an era in which prospectors unearthed their dreams with a pickaxe and boots. The Pike’s Peak gold rush saw more than 100,000 hopefuls pass through the territory in search of wealth. It was an echo of the California Gold Rush. Enthusiasts famously stated, “Pike’s Peak or Bust!” Some even braved hundreds of miles of travel through the punishing Colorado winter to get a head start on the boom. In time the saloons and post offices became ghost towns eroded by the seasons. While the log cabins and town halls crumbled Gruber’s coins endured. Today, collectors can hold a piece of US history with one of his coins. It was the piece that gave rise to the Colorado Territory and the identity of America as a place of wild expanse hiding fortunes. The Denver mint is operational to this day. The operation boasts a daily production that can run as high as 50 million coins. To date, Denver has minted more than 300 billion coins.